A very small group, being just the three of us, made their way down the long winding and slow road that is the N2 to just past Port St Johns. Winter means that the grass is a deeper yellow, and the afternoon skies shaded with pinks and purples more often than in the the early summer. Of course it also means that unless there has been a decent blow of wind, there is more haze from cooking fires and the dry dust picked up along the labyrinthine dirt roads that run like spaghetti between the village-topped hills. This can result in more colourful sunsets, but can also mean for duller blue skies and a haze at night. Overall, we were extraordinarily lucky with the weather and the light that we received. Our first day at Hole In The Wall was cloudless for almost the whole day, with clouds finally developing at sunset and staying the course through the evening. Similarly the second day also began without a cloud in the sky, but had dramatic puffs of cumulus floating behind the ‘Whale Rock’ and ‘Hole in the Wall’ by sunset. At this point we were watching the glowing yellow ball that the moon had become, rise majestically over the Indian Ocean, bathing the landscape in eerie yellow light. Our images of the region's namesake looked more like they had been shot in the middle of the day than 9 o’clock in the evening. Being a small group it also meant that we were able to try some things and see some locations that ordinarily we wouldn’t. So on our second morning the three of us did the short scramble up the side of ‘Whale Rock’ to watch the sunrise as the light slid down the side of ‘Hole in The Wall’. It also meant that when we were in Port St Johns we were able to attempt a second star trail and time-lapse shoot since none of us were particularly happy with the first attempt. I would also add that my traveling companions were clearly nutty as our last night ended in…more of that in a moment. 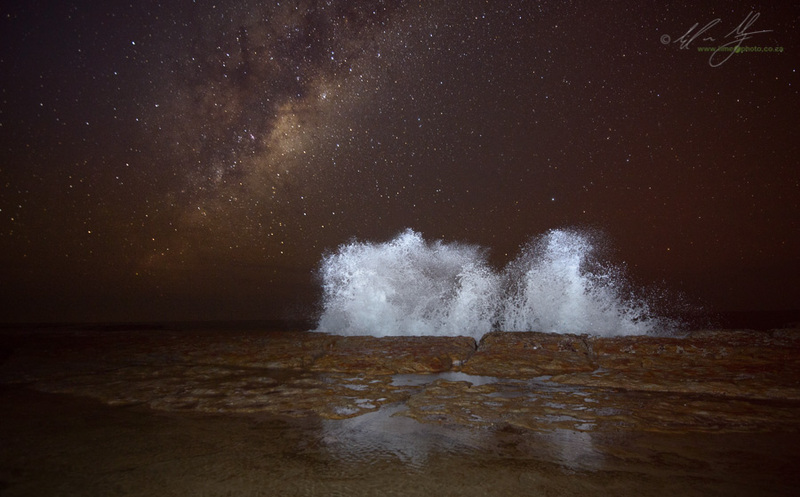 One of the things that defines the regular trips that Nature’s Light takes to the Wild Coast is the fact that things get wet, salty wet. Each evening when it comes time to take a shower, you end up sharing the shower with your three-legged friend, of the carbon fibre and aluminium persuasion. I cannot emphasise enough how important it is to wash the salt spray and water off the tripods that are used. The salt water is an absolute killer to tripod screws and joints, eating its way through the magnesium shoulders, aluminium threads and even damaging the surface of carbon fibre to a point. Keep your tripods clean and get used to showering with them. That said, this year there were no equipment fatalities and everything made its way homewards without so much as a filter scratch. What a relief. After Hole In The Wall we made our way north along the dirt roads toward Port St Johns. 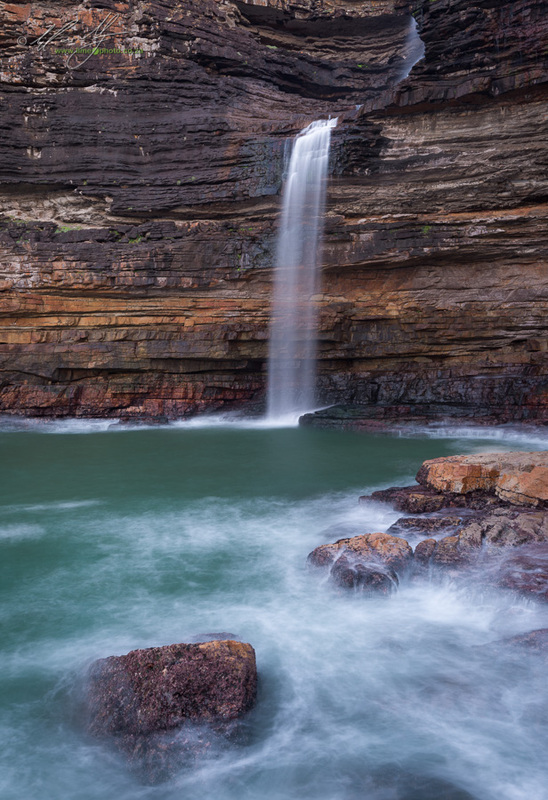 Here the highlight has to be Mount Thesinger with its commanding views of the Mzimvubu River Mouth, but the coastline has so much more to offer. A shortish drive past Agate Terrace and you find yourself above the imposing bluffs along Poenskop. Take the other direction and you find the beautiful and secluded Silaka Nature Reserve (sadly not on our already filled itinerary). With so much to photograph and do it seemed like we barely had time to blink and we were already moving towards the amazing rock shelf of Luphathana. One tends to hear horror stories of the Wild Coast, of crime and protests and failing towns. Of antagonism towards outsiders and crazy accidents along the highway. My experience has been very different though. Crime is a reality wherever you go nowadays, but the Wild Coast certainly isn’t the hotspot that some tourists make it out to be. People have been remarkably open and friendly wherever we have visited. Invariably, while trundling down a rutted dirt road, the oncoming driver will give a smile and wave whether they are in a clapped out old Toyota bakkie held together with bailing wire and string or in a new Mercedes gingerly edging forward over the sharp stones and ruts. That isn’t to say crime doesn’t occur, but that it is reported more readily along the ‘bush’ telegraph. Coming into Lusikisiki we were met by winding long queues into the fuel stations. The few stations that there are were under pressure after the owner of one of the biggest had been murdered two nights prior to our arrival by armed robbers, and hence the station being closed. The remaining fuel stations were now struggling with a fuel shortage after a delayed delivery. In a town like Durban or Johannesburg, the crime might have made a short paragraph in the local newspaper. In Lusikisiki it’s BIG news. As with any travel, be aware and be careful, but also be prepared to accept people’s friendliness as just that and without strings attached. Coming down from Luphathana one bumps down the annually shifting dirt track to the incredible crashing waves of the Ocean against the rocks. Staying at the Drifters Camp we had immediate access to some of the most incredible scenery available; enormous waves that angrily smash into a rock shelf, towering dozens of metres into the air before crashing down harmlessly (although scarily) at your feet. I don’t know anywhere else where you can stand in relative security as waves threaten to topple and wash you away…but don’t. Luphathana is phenomenal for this experience. 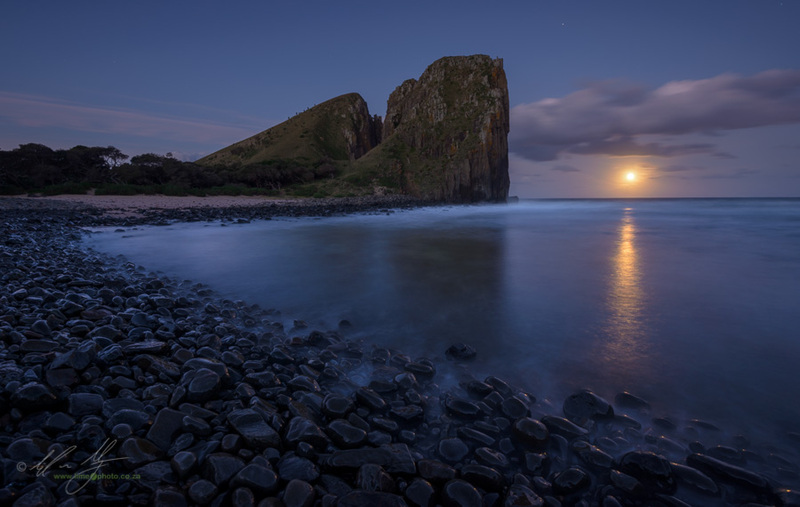 Luphathana is also the spring board for the Wild Coast’s iconic Cathedral Rock. This is a pair of enormous stone arches that rise like magnificent Gothic cathedrals from the edge of the bluffs. Cathedral Rock itself is the smaller of the two arches but is visible from the cliffs whereas the larger arch requires being on a boat to be seen. After a wonderful morning walk and shoot at the amazing Waterfall Bluff we made our way to Cathedral Rock where a plan of sorts was hatched. 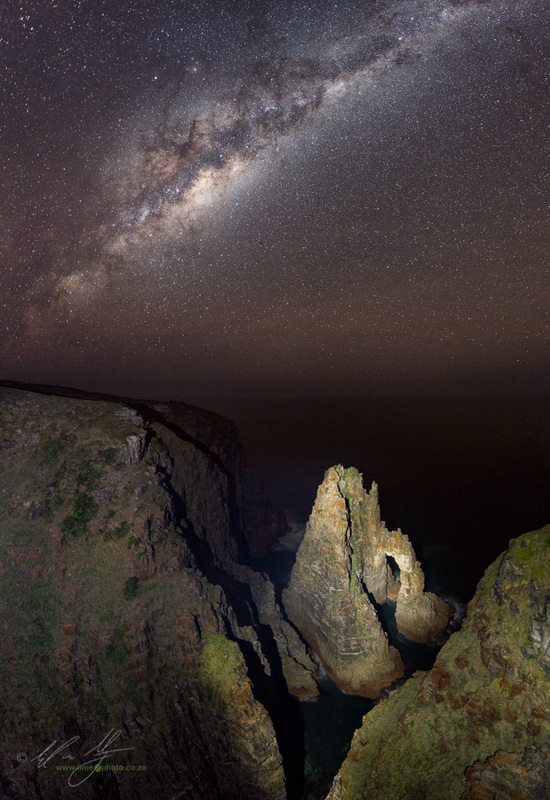 Why not photograph the rock with the stars above. 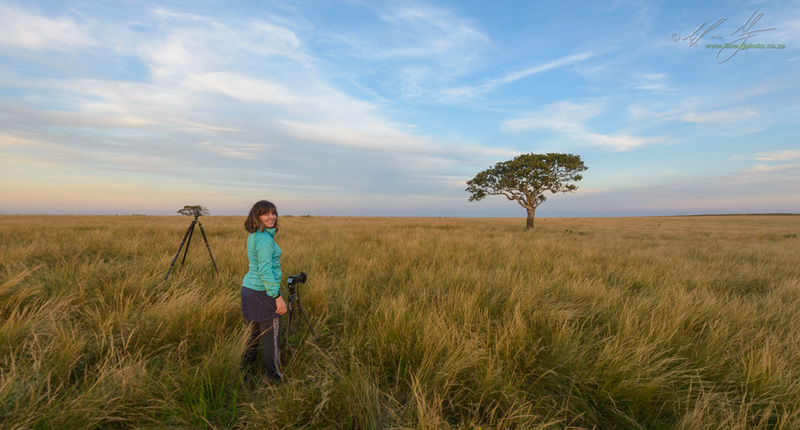 On our last night on the Wild Coast, Joanne and myself made our way in the late afternoon the 6 kilometres south from Luphathana, Claire had sadly hurt her leg several days prior so spent her evening working on the video attached to this link. Then we waited as the sky darkened and stars started to pop out on the horizon. Taking it in turns we painted the rock with an LED torch and occasional pops from a hot-shoe flash. The experience was phenomenal. Nothing but the sound of crashing waves echoing under the arches could be heard (possibly the occasional mild expletive from myself as the haze from distant cooking fires caused a light smudge from the torch as we tried to light up the Cathedral). Satiated by the experience more than the resultant images we made our way back in the absolute pitch dark. Wandering somewhere along the Wild Coast in the middle of an empty grassland, we switched off headlamps and gazed at the sky above. A panoply of stars twinkled down on us, the Milky Way stretching like a lacy ribbon into the east.